Almost five years later and I am still a huge fan of this no-nonsense, results-driven brand. 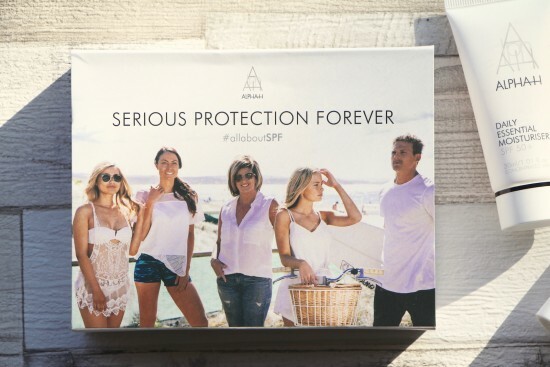 My latest Alpha-H discovery, the brilliant Liquid Laser, will be featured here soon, but today I want to talk about their sun protection range and – more specifically – the new #allaboutSPF campaign. I have a whopping great fifty sets of SPF skincare to give away, too, so make sure you keep on reading! The idea that SPF is the most cost effective anti-aging product on the market is actually quite obvious, but I had never thought of it like that before. A recent study by Queensland University, one of the global leaders in skin cancer research, showed that there was absolutely no detectable skin aging after four and a half years in their 903 study participants who applied SPF30+ on a daily basis. That’s actually quite incredible – all of those expensive lotions and potions we snap up to try and reverse damage when the damage could so easily be prevented in the first place. I asked Michelle what the most frequent SPF user-errors were. Michelle says that it’s important to choose the right sun care product for your needs, but recommends SPF 50+ (UVA and UVB protection, always) if you are outdoors for prolonged periods. There are two SPF 50+ products in the giveaway set; the first is the Daily Essential Moisturiser, which is great for normal to oily/combination skin. I can’t even count the number of outdoor model shoots I’ve been on where this sunscreen has been used as a sort of mattifying primer-base beneath the foundation. It has a lovely velvety finish and doesn’t feel chalky or heavy. The other product in the giveaway set is the new Protection Plus Daily SPF 50+. This formula is far richer and great for dry skin – it helps to rehydrate as it protects, using Pomegranate Nectar and Mango Seed Butter to deeply nourish as well as a range of antioxidants to help fight free radical attack. This one has more of a comfortable, moisturising finish rather than being matte and makes a beautiful base for a more dewy makeup look. And they are very kindly sharing their sun protection here, with FIFTY special sets to give away. Each set, worth £40, contains 30ml of the Daily Essential Moisturiser SPF 50+ and 30ml of the Protection Plus Daily SPF 50+. To be in with a chance of winning a set, just leave a comment below (making sure you type your email into the form where prompted so we can contact you, one entry per person only, open worldwide) telling us who you would share your Sharing is Caring set with. The giveaway will be open until 12pm (GMT) on Monday the 7th March, 2016 and winners will be announced the following day. Good luck! The post Alpha-H “All About SPF” Skincare Giveaway appeared first on A Model Recommends.